this is my playground. i put up projects that i'm working on including digital art, experimental programming, music, and design work. i'm interested in genetic algorithms, self-modifying code, networks, innovative js, web development, design, music, web sound. Zimride is a growing, innovative carpooling service. I took a year off from my undergraduate time at Brown University to take a full-time application developer position at Zimride. I started at Zimride living and developing out of an apartment in Palo Alto. The company has since grown, continued to innovate, and moved to a schnazzy office in San Francisco. I was one of the original developers at Fanium, a Twitter-based sports startup. I helped to architecture the Fanium system, building it out on a team of three developers. Collaborating with a RISD graduate, we designed intuitive user experiences and playful designs. Statement: Learning to Play interrogates the idea of emergent intelligence by playing music along with whoever plays the keyboard. As the person plays Learning to Play becomes better. By basing the melody off of the unique actions taken by the person, Learning to Play creates a unique musical intelligence with each interaction. 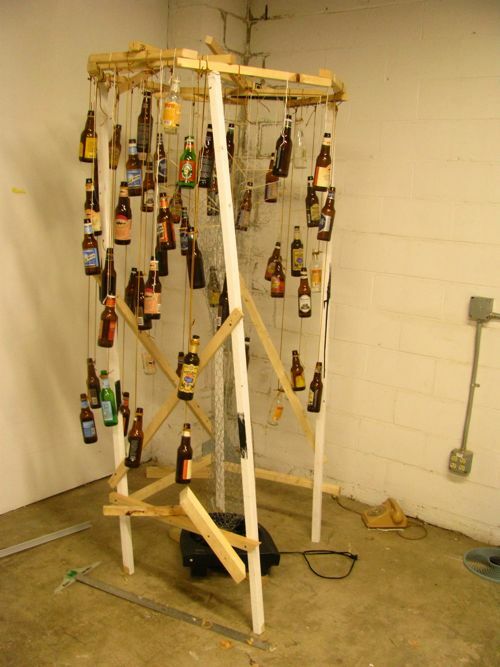 Statement: Hanging Beer Music is an exploration of the music in our everyday lives. Constructed from materials scavenged from my dormitory while at Brown, the sculpture consists of a wooden structure as tall as a person, a flanged chicken wire and kabob stick player, beer bottles with variable amounts of water hanging, and a cannibalized fan to drive it all.